PENANG football may have slipped into the wilderness after their professional state side was relegated to the less lucrative Premier League for the first time in their rich history last year. But this has not stopped the Panthers from setting a goal to reach the Malaysia Cup stage as their prime target this year. Gearing up for new season: Veloo watching his USM FC players doing drills during a training session at the USM field. The state side begin their crusade today. Penang will parade three teams in this year’s second tier Premier League this year — USM FC, the Royal Malaysian Navy side Sinar Dimaja and the Panthers. 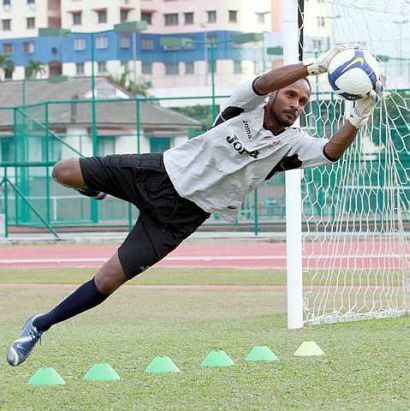 Sure hands: Former Johor FC goalkeeper Jeevanatham , now with USM FC, practising his moves. USM FC, who retained their place at the end of last year’s Premier League campaign, are also eyeing a top four finish, since only the top four from this second tier league will make the cut to the Malaysia Cup proper. Penang’s newly acquired coach Robert Scully has taken up the challenge to help his home state regain their pride in Malaysian football. He said making the cut to the Malaysia Cup was high on their list of priorities. “We now realise just how painful it is for our ardent fans to face up to the reality that the state is no longer a force in football,” said Scully, a lethal hitman for Penang in the 1980’s. “When I decided to call it quits with my employers — the National Sports Council (Majlis Sukan Negera) — to answer Penang’s call for help, I knew qualifying for this year’s Malaysia Cup action would be an important target. Scully, who until his return to Penang, was coaching the National Youth squad players, has roped in 15 imports as part of his rebuilding process. He added that these imports, though not among the elite in the country’s football, were mostly young players armed with at least one or two years’ experience in the M-Super League. Among the prominent players that Scully brought to Penang was former national goalkeeper Megat Amir Faisal. Megat Amir has been made skipper due to his experience and seniority. The other imports are Mohd Riduwan Ramli, Wan Zaim Azizan (both Kedah), Elfie Elyaz Harizam (Perlis), Rizal Ahmad, Mohd Arsyah Ayob (both Felda United FC), Mohd Arif Saidin (Perak FA), Abdul Latiff Sulaiman (Malacca), Hafizi Roslee (Proton FC) and Mohd Hafidz Romly (KL Plus FC). USM FC coach S. Veloo has also left no stone unturned in preparing his charges. He has beefed up their team with imports from their home state as well as from other Super League outfits like Johor FC, Perlis and Perak. Among the notable players Veloo has succeeded in bringing to his university outfit are Perlis defender Shariman Che Omar, Johor FC keeper G. Jeevanathan and Perak midfielder Mohd Hafiz Abdul Rahman. Veloo added that he had also roped in ex-Panthers youngsters S. Tinagaran and Mohd Failee Ghazali. “The promising results shown during our warm-up matches are encouraging,” he said. “My players are serious and they showed their hunger to do well during the friendlies. “This has given me confidence that we are ready for our campaign,” he said. USM FC open their campaign with a home game against Police at the USM Stadium tonight while Penang will entertain Sarawak in an afternoon clash at the City Stadium. The other Penang representative in the Premier League, Sinar Dimaja, will open their campaign with an away assignment against Harimau Muda ‘B’ at the Selayang Municipal Stadium tomorrow.